Now that my work as a Round 1 judge for the Cybils Awards in YA Speculative Fiction is done, I'm catching up on all the middle grade I missed! Charlie Hernández and the League of Shadows, by Ryan Calejo, for instance, came out last October....but better late than never! Charlie is not an ordinary middle school kid. His house burned down and his parents disappeared, he hasn't given up on finding them again. But's what really weird is the horns and feathers he grew for no apparent reason. This magical manifestation is the start of a wild ride that throws Charlie into the middle of an ancient battle between mythological beings fighting for the fate of the world. The horns and feathers could mean he is the chosen one who will tip the balance in favor of the side who wants to protect the land of the living....but unfortunately for Charlie, he doesn't have an instruction manual for possible chosen ones. 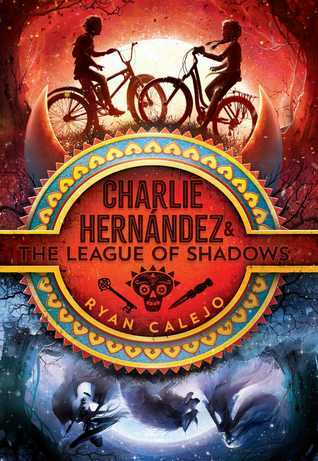 On the plus side, however, Charlie's grandmother filled his childhood with stories of Hispanic mythology from both the old world and the new, so he's able identify both the beings trying to kill him, and the smaller number of non-murderous beings on his side. And he also has the help of the smartest, coolest girl in school, Violet Ray, investigative journalist in training, who brings both a cool head and great research skills to Charlie's problems. It's a fun and exciting ride as Charlie and Violet search for answers, and try to stay alive! It's perhaps a cliché to say that fans of Rick Riordan will enjoy this lots, but it's the same sort of story, although Charlie isn't a demigod, and has yet to have cool powers under his control (although this seems like it will happen in the next book....). The conversations are peppered with lots of Spanish, making this especially friendly for Spanish speaking kids, but not so much as to be problematic for non-Spanish speakers.